Some of the biggest challenges when testing software can be getting the software into some very specific states. You want to test that the new error message works, but this message is only shown when something on the back-end breaks and the back-end has never broken before because it always "just works". Maybe the software you have to test is powered by other people's data, data that you have no direct control over and you really need to manipulate this data in order to perform your tests. There is currently no option within the software itself to change or manipulate the text displayed on the list because the software retrieves this list of data from someone else's API. We have no control over the data returned by the API, our software under test just displays it. Well most testers would start by looking at it. It appears to work correctly. Items can be selected, the Submit button can be clicked. 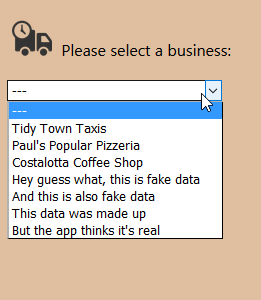 But how would this drop-down behave with a different set of data behind it? Well we don't know (yet) but it is possible that it could appear or behave differently. One solution which would allow more scenarios to be tested would be to force the drop-down list to use some fake made-up data. This approach is commonly referred to as testing with mock data or simply "mocking". Let me give an example. If an API is hard-coded to always respond with 0, 1 or 2 as a status code and you decide to mock this API response to return "fish". As soon as the software asks "what's the status?" and it gets the reply "fish" it might explode because it wasn't expecting "fish". Although this explosion would be bad, this might not be a really big problem because it was your mock data that caused the fish explosion and "fish" is really not a valid status code. You could argue that in a real world environment this would never happen (famous last words). To start using mock data the software under test needs to be "tricked" into replacing real data with fake data. I'm sure there are many ways to do this but one way I have seen this successfully achieved is through the addition of a configuration file. This configuration file can contain a list of keys and values. The keys being paths to various API end points and the values names of files that contain fake API responses. The application code is told to check the config file and if it contains any fake responses to use those instead of the real responses. 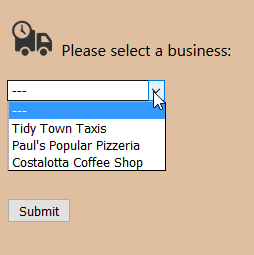 Let's continue with the example of our software which displays the names of local businesses as values as a drop-down list. To keep things simple I'm going to say that this software uses a REST API with the following request and response. Reserved words "NULL", "False" etc. False positive profanity e.g. "Scunthorpe"
Mock data can also be used to see how an application handles API responses which are not "200 OK". We can start testing error states by tricking the software into thinking the API end point returned an error when it didn't. Testing error handling becomes especially important when the software reacts in different ways to different types of errors which can occur. If you're looking for ways to improve the 'testability' of applications that you are building, consider adding a way to launch the application using mock data. You might be surprised how creative testers can be with data and you could start to spot issues that otherwise would have been missed.